Weddings are the perfect time to show off your sense of style and your love of handmade. 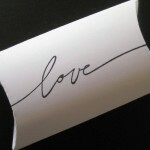 Etsy even has a blog dedicated to Handmade Weddings. Whether you want to go all out and have a themed wedding, or just want to pick one or two custom items to make your day perfect, you’ll find just the perfect thing on Etsy. I designed and made my own table number cards for my reception. I loved that I was able to contribute to the event. 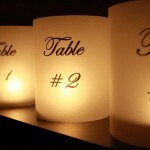 If I’d known about Etsy at the time, I may have gone with table number luminarias instead. I can imagine these glowing beauties lighting the tables of an early evening reception. The Papery Nook‘s Sarah Sewell believes that there is something magical about using elements of the earth to create a beautiful ambiance. 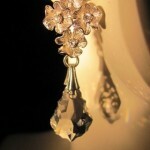 Her quality handcrafted products are personalized and affordable. 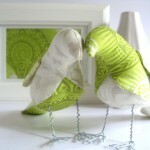 Cassy Beattie of Ella Loves Cale makes adorable love birds that can be used as wedding cake toppers. When she is not attending to her two children, she can be found making fantastic items. She will even custom make an item just for you. I wish I’d seen these when planning my wedding. Diana of 4 Classy Designs will also be happy to make a custom item for you. She doesn’t just make standard jewelry; she creates floral and cake decorations that will add some bling to more than the bride. Diana loves to help her customers dream up big ideas for their special day. 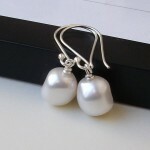 These beautiful and reflective earrings will draw all eyes to the bride. 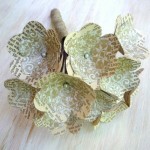 Megan Adkins of Wild Paper Flowers takes a road less traveled with this unique idea for a bridesmaid bouquet. 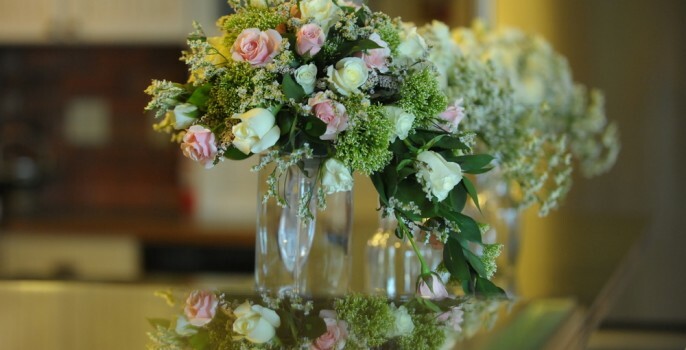 After making flowers for her own wedding, she loved them so much that she now shares them with other brides and those looking for wedding inspiration. This bouquet won’t wilt and fade away like other bouquets, and can be used to decorate any room in your home. Nur Yourself – “Nūr” in Arabic means light or illumination; in Hebrew it means fire. This very unique outdoor lighting would surely bring an intimate and relaxing atmosphere to any ceremony or outdoor reception. 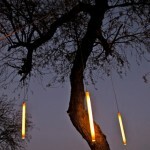 These glowing rods designed by Gabriel Fontanillo will help light up your memorable evening. BellaBeanCouture is family owned and operated. The dynamic trio consists of designer Faith, seamstress Patty and tutu-artist Heather. The three combine their skills to make lovely apparel for little ones in this special shop. This adorable top and tutu will have the flower girl feeling all grown up. Don’t forget about the boys. This shop makes handsome bow ties, vests and other apparel for ring bearers too. Bridal Beads – Classic and elegant. Finding just the right jewelry for your bridesmaids is not an easy task. My bridesmaids all had very different design tastes and unique styles. Pearls are one of those things that tends to be universally adored. 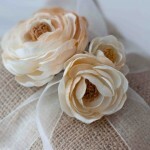 Give them as a gift to your bridesmaids or have them wear the custom creations on your big day. Better yet, do both! Courtney O’Dell of Sweet C’s loves to make wedding decor and favors that can be re-purposed and loved for a long time after the vows are read. 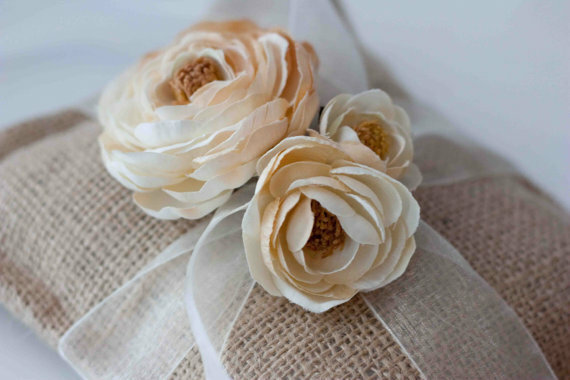 If a silk pillow with satin ribbon is not going to fit with your wedding theme, take a look at Sweet C’s ring pillows made of burlap. They might be just what you’re looking for. Mary Leavitt of River Road Rustics makes rustic wedding and home decor alongside the Snake River in Idaho. Add a cute, rustic touch to your reception. 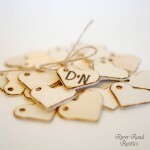 Mary’s wood heart tags are perfect to wrap around that favor bag, box or purse. Each one of these hearts is carefully hand-distressed before the lettering is meticulously engraved free-hand. Love certainly goes into making these little charms! Tree Top Paper Crafts makes these pillow boxes no one will leave behind when the night is over. Fill them with Jordan almonds, mints, seeds or anything else that fits your fancy. These hand-stamped boxes are perfect for holding six chocolate kisses and come stamped with the word love, hearts or whimsical love birds. With three styles, there is something for the modern wedding, the traditional wedding and the eclectic and fun wedding. Etsy allows you to create a Wedding Registry to store all your favorite items. Now your friends and family can be assured that they’ll get you just the handmade items that you want. Cover image by Sherri Barber of Sherri Barber Photography. Love your blog and the items you showcased. I do appreciate being among those wonderful pieces you displayed, thank you, thank you, thank you!! !